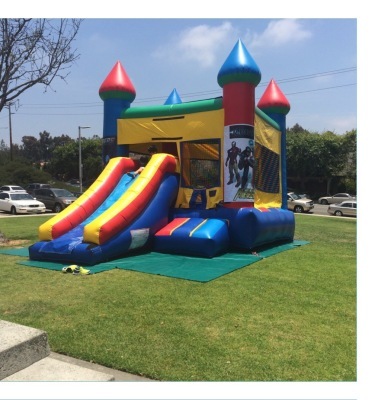 All Star Jumpers has jumper sliders and slides available for rent for your next party or event. We have a wide selection of banners available that we'll personalize to best suite your party theme. We have inflatable characters that can be added to your jumper upon request. Generators are available upon request. We have a combo 4-in-1 jumper rental available. All of our jumper rentals are approved by the City of Chula Vista. Call us today to ask about our special packages. Get your favorite characters and themes for your kids birthday or your next event. Spice up your kids birthday party or event with our jumper slides. All Star Jumpers has water slides of different sizes available that your kid will love. We have personalized banners and inflattable characters avaialble to go with your jumper slide. Your favorite characters and themes for your kids birthday, party, or event are just one phoce call away! We offer a 4-in-1 combo with a slide that is approved by the City of Chula Vista. Call us today to ask about our special packages.